The recipients of the 2013 Caroline Huetter Award. From Left to Right: Victoria Villa, Madison Womack, or Cameron Holt. 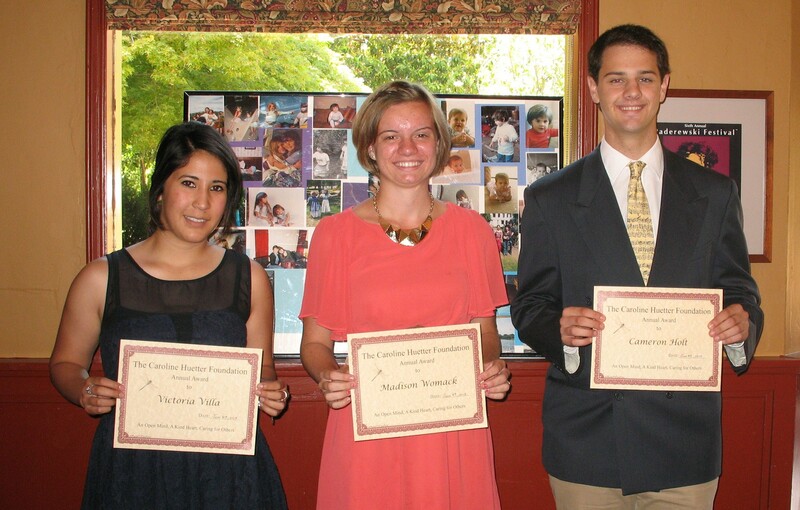 The 2013 Caroline Huetter Foundation Awards were presented on June 8, 2013, to Cameron Holt, Victoria Villa and Madison Womack. They were recognized for their embodiment of an open mind, a kind heart and caring for others. The award is made annually to recognize a Central Coast young person and includes a cash stipend to be used for any purpose they choose. The quality of the nominees this year led the Foundation Board to approve unprecedented multiple awards. Each individual earned the recognition for varied, individual contributions to their communities. Victoria Villa, from the San Miguel community, is a business major at Fresno State University. She works with autistic kids to boost their independence and cognitive abilities. It is her active support of sports programs for disadvantaged elementary school kids that further led the Foundation to recognize her. Madison Womack graduated on 12 June from Atascadero High School. She single-handed the start-up and coordinates the continuing operation of an activity which gathers and delivers handmade cards and crafts to a family or person in need every month. She has also participated in inner city projects in L.A. Her personal “I Feel the Love Project” is now international but started with one favorite teacher. She is headed to Cuesta College. Cameron Holt is a 2013 graduate of Paso Robles High. He started the Paso Robles chapter of the “Students Against Violence Everywhere” to counter bullying and encourage tolerance. He is past president of the school’s Gay-Straight Alliance. Music has been a major commitment throughout his life; he plays several instruments, including the tuba, and is a drum major. Holt will be going to the University of Southern California this fall. The three winners and their immediate family gathered for a luncheon and presentation of the awards at the Paso Robles Inn. Also this year, in honor of Caroline’s love of music, partial scholarship support was also made to the Central Coast Jazz Institute, presented at a concert on June 9 by the Institute’s young musicians held at D’Anbino’s Tasting Room in Paso Robles, CA. To learn more about the Foundation, make a contribution or make a nomination for next year’s award, please visit our nomination or contribution pages.